Believe.in has always been a beautiful, well-designed platform that enables everyday people to co-ordinate and promote their fundraising efforts. A site redesign that rolled out today is taking that one step further, adding a dynamic tile interface across its homepage, user and charity profiles. The site is now responsive, displaying between one and four vertical columns that summarize recent and notable activity of its users. It’s somewhat reminiscent of Google+, splitting over 20 different types of activity such as new events, campaigns, donations or status updates into accessible blocks. Tiles are generated automatically as users navigate the site, which means their own page will be populated and maintained automatically as they go about their various fundraising efforts. Each tile also has its own URL so that just like individual tweets or Google+ posts, users can easily broadcast what they’re up to on other platforms across the Web. Of course, that also drives further engagement with Believe.in as a whole, which will undoubtedly support the startup’s mission of creating a thriving community of fundraisers, as well as a steady stream of donations. 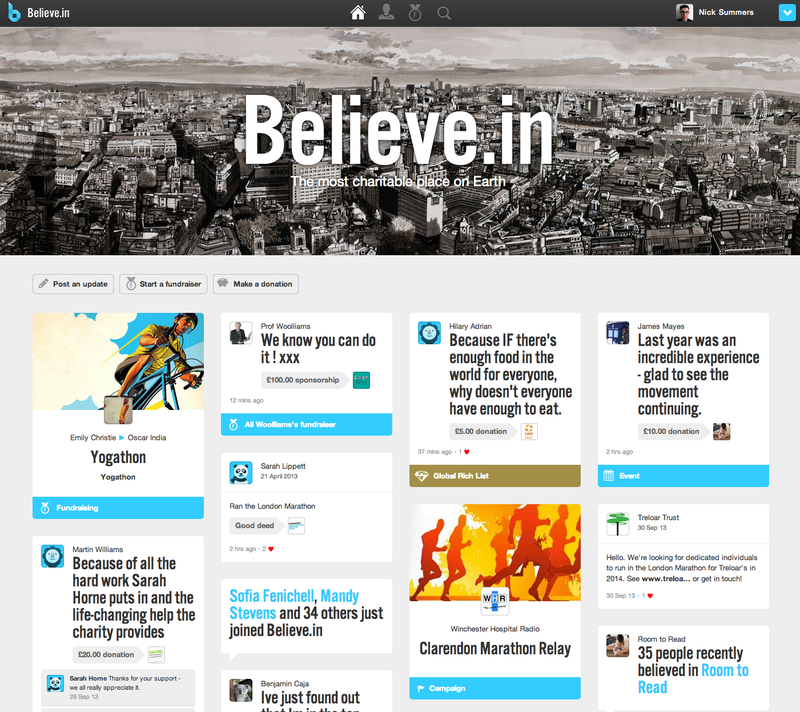 If you’ve ever wanted to raise money for charity, Believe.in is the perfect place to start. Individual charities such as UNICEF, Cancer Research UK and WWF also have their own profile pages, which streamlines the process of finding a worthy cause and submitting your donations at the end of an event or campaign. But above all, the interface is simple and intuitive, making it accessible to pretty much anyone. In short, this is well worth checking out.